Japanese screenwriter/director Koreeda Hirokazu’s The Third Murder is a slow-burning psychologic thriller that grabs you from its opening moments and never lets you go. The story follows high-powered defense attorney Shigemori Tomoaki (Fukuyama Masaharu) who is assigned to defend a criminal named Misumi (Yakusho Koji). Misumi was convicted thirty years earlier of killing two men and was recently released from prison, now he is facing charges for killing and burning the body of the factory foreman where he was employed. Misumi confessed to the murder although there were no witnesses, but his story keeps changing, so Shigemori has to get to the truth of what happened and try to keep Misumi from being sentenced to death. Shigemori initially doubts that Misumi was responsible for the murder, but the more he investigates and the more Misumi’s story changes, the more he begins to question Misumi and starts to doubt his own initial assessment. The Third Murder is a film that deals in characters and locations. Koreeda rarely takes this film above a slow simmer, but one can sense the rapid boil of emotions about to overflow, and the undercurrent of emotions simmering. One of the greatest scenes comes when Shigemori and Misumi, during one of their many meetings in prison square off with the prison glass between them, and Koreeda, using a brilliant camera angle, makes the glass virtually disappear, have the two men face-off, an invisible barrier between them as they stare each other down. The symbolism is powerful. Koreeda also shows us the more drab and mundane parts of Tokyo, avoiding the high-tech and glitzy sides most international audiences have come to associate with the bustling city. This is a Tokyo of narrow side streets in the suburbs, cluttered homes, dim restaurants, and his palette reflects the downbeat nature of the story as well – gray, a little desaturated, shadowy indoor scenes, like a cloak over the proceedings hiding truth. 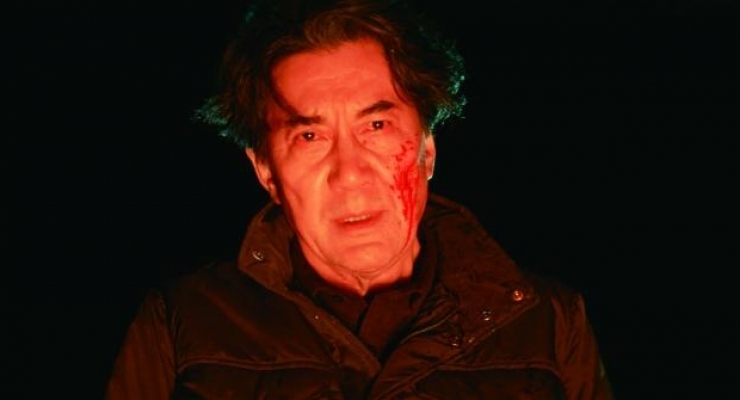 The Third Murder won 6 Japanese Academy Awards including Best Film, Best Supporting Actor (Yakusho Koji), Best Director (Koreeda Hirokazu), and Best Screenplay (Koreeda Hirokazu) and was nominated for a Golden Lion at the 2017 Venice Film Festival (Best Film – Koreeda Hirokazu). The 2.8K HD source for The Third Murder, shot on the Arri Alexa XT Plus with Cooke Anamorphic/i, S4/i, Lensbaby and Angenieux Optimo 2S lenses arrives in a beautiful AVC 1080p encodement framed at 2.35:1. This isn’t a film that will wow with its color palette since it remains rather drab straight through, but it looks crisp and filmic, only softening and getting a bit murky in some of the shadows, that tend to look more charcoal grey than inky black. That said, it’s a satisfying, and clean presentation with no major issues such as banding or motion artifacts. 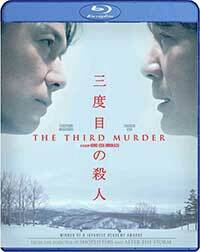 The Japanese DTS-HD Master Audio 5.1 mix for The Third Murder is a straightforward, front-heavy track that is dry and still most of the time with clear and minor dynamics. The surround channels carry little atmospherics and only occasionally the subtle sound of wind or traffic noise. Low end is a non-consideration. Film Movement offers up a strong slate of special features, including the poignant short film, A Gentle Night from director Qiu Yang and the 30 minute making of. Bonus Short Film: A Gentle Night directed by Qiu Yang (2017 Palm D’or winner for Best Short Film) – In a nameless Chinese city, a mother with her daughter missing refuses to go gentle into the night. The film forgoes the usual violence and visual effects gimmickry of crime thrillers and instead focuses on a character-driven psychological thriller, gorgeously, rendered cinematography, and a tight screenplay. This Blu-ray is reference quality and should grace the shelves of any film buff. A defense attorney must uncover the truth behind the murder of a factory foreman when his client, recently released from prison after being convicted for killing two men thirty-years earlier, confesses to the murder, but keeps changing his story. A slow-burning and taut psychological murder mystery, The Third Murder is a gripping character study that deals in everyday drama, has powerful performances from its cast, and beautiful cinematography. The film took home six Japanese Academy Awards including Best Film and Best Director for Koreeda Hirokazu and garnered a Golden Lion nomination at the 2017 Venice Film Festival.